“The Lord’s Day”, Saturday, Sunday, or neither? In my search for Truth, I have come across many theologians who make an attempt to use a verse in Revelation 1 as a supporting verse for changing the Sabbath from the seventh day of the week to the first. This is the ONLY scripture that uses the phrase “The Lord’s Day” in the entirety of our English Bibles. Many years of Christian theology and bad interpretations have led the majority of people in the World to think John in the Revelation of Yeshua the Messiah was talking about being in the Spirit on a SUN-day, but is the interpretation correct? Can we use this verse as a supporting testimony for the change? Let us test this theory and see what exactly we come up with. The Book of Revelation is a Prophecy. We see here three things, we see that the Book of Revelation most certainly is a Prophecy. We see here that the man who hears and keeps the words of the Prophecy in this book is blessed. We see here that the man who adds to or takes away from the Prophecy of the words of this book shall be cursed with all the plagues written in this book, so interpreting this Prophecy should be dealt with the utmost care and diligence, lest we receive the curses of the book. There is one rule the Bible gives for interpreting Prophecy. 2Pe 1:20 Knowing this first, that no prophecy of the scripture is of any private interpretation. 21 For the prophecy came not in old time by the will of man: but holy men of God spake as they were moved by the Holy Ghost. So, this one rule is what we need to focus on. In this scripture, it says that NO PROPHECY IS OF ANY PRIVATE INTERPRETATION. What this means is you cannot interpret the Prophecy as you see fit, you must let the scriptures tell you the Prophecy and let the Word of YHVH(God) define and interpret the Word of YHVH(God). We cannot take a traditional approach to interpreting this one verse, because if we do, there is not one single scripture to interpret, define, and unlock what this scripture is saying. Now, the first thing we need to find out is what is “The Lord’s Day” in scripture? Is there a common theme all throughout the scriptures that define “The Lord’s Day” and tell us exactly what and when it is? Well, thankfully, the Bible has quite a lot to say about “The Lord’s Day”. Is it Saturday? Is it Sunday? What if I told you that this day can fall on any day of the week? Let us first find what “The Lord’s Day” is, and how the entirety of scripture defines it. First, we must understand that in Greek, the language that the Book of Revelation is written in, there is no punctuation, and most certainly no possessive nouns followed by an apostrophe s. In English, the phrase should read, “Day of the Lord”. The English translators thought they were doing us a favor by adding punctuation when no punctuation is given. Already we are getting into dangerous territory by adding to and taking away from the words of this Prophecy. 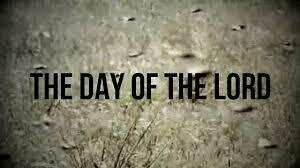 So, how does the Bible define “The Day of the Lord”? Eze 30:3 For the day is near, even the day of the LORD is near, a cloudy day; it shall be the time of the heathen. 4 And the sword shall come upon Egypt, and great pain shall be in Ethiopia, when the slain shall fall in Egypt, and they shall take away her multitude, and her foundations shall be broken down. Joe 2:1 Blow ye the trumpet in Zion, and sound an alarm in my holy mountain: let all the inhabitants of the land tremble: for the day of the LORD cometh, for it is nigh at hand; 2 A day of darkness and of gloominess, a day of clouds and of thick darkness, as the morning spread upon the mountains: a great people and a strong; there hath not been ever the like, neither shall be any more after it, even to the years of many generations. Joe 3:14 Multitudes, multitudes in the valley of decision: for the day of the LORD is near in the valley of decision. 15 The sun and the moon shall be darkened, and the stars shall withdraw their shining. Zep 1:14 The great day of the LORD is near, it is near, and hasteth greatly, even the voice of the day of the LORD: the mighty man shall cry there bitterly. 15 That day is a day of wrath, a day of trouble and distress, a day of wasteness and desolation, a day of darkness and gloominess, a day of clouds and thick darkness,16 A day of the trumpet and alarm against the fenced cities, and against the high towers. Zec 14:1 Behold, the day of the LORD cometh, and thy spoil shall be divided in the midst of thee. 2 For I will gather all nations against Jerusalem to battle; and the city shall be taken, and the houses rifled, and the women ravished; and half of the city shall go forth into captivity, and the residue of the people shall not be cut off from the city. 1Th 5:2 For yourselves know perfectly that the day of the Lord so cometh as a thief in the night. 3 For when they shall say, Peace and safety; then sudden destruction cometh upon them, as travail upon a woman with child; and they shall not escape. We see here that all throughout scripture, “The Day of the Lord” is the day that the Messiah returns to recompense vengeance upon his enemies. “The Day of the Lord” is most certainly not any day of the week, but it indeed is a Sabbath, but not the weekly Sabbath. We know that on this day, the Sun and Moon does not give it’s light and that on this day, all the armies of the Earth will be gathered to battle against the King of Kings and His Heavenly hosts. We cannot point out exactly what day of the week this is because this falls on the Feast of Trumpets, also known as the Day of Announcements, the Day “no man knows the day or hour”, Yom Teruah, and Rosh Hashanna. This day is the Feast of Trumpets, and is indeed a High Sabbath commanded to be observed. Lev 23:24 Speak unto the children of Israel, saying, In the seventh month, in the first day of the month, shall ye have a sabbath, a memorial of blowing of trumpets, an holy convocation. 25 Ye shall do no servile work therein: but ye shall offer an offering made by fire unto the LORD. The Feast of Trumpets can fall on any day of the week, and is always on a New Moon, when the Sun gives no light. For those out there observing a sliver moon, may I suggest the next few verses for your discernment. Mar 13:24 But in those days, after that tribulation, the sun shall be darkened, and the moon shall not give her light, 25 And the stars of heaven shall fall, and the powers that are in heaven shall be shaken. 26 And then shall they see the Son of man coming in the clouds with great power and glory. 27 And then shall he send his angels, and shall gather together his elect from the four winds, from the uttermost part of the earth to the uttermost part of heaven. Joe 3:13 Put ye in the sickle, for the harvest is ripe: come, get you down; for the press is full, the fats overflow; for their wickedness is great. 14 Multitudes, multitudes in the valley of decision: for the day of the LORD is near in the valley of decision. 15 The sun and the moon shall be darkened, and the stars shall withdraw their shining. This says the harvest is ripe, the press, meaning winepress, is full, the moon shall not give it’s light, and a great trumpet shall sound on this day. The Feast of Trumpets is the ONLY day this can be referring to. The winepress can only be full in the fall as the grape harvest is ripe, the only day the moon does not give it’s light on a commanded Feast Day which are all prophetic of our Messiah, and only day where it is commanded to blow trumpets during this time. The reason it is known as “the day no man knows the day or hour” is because it falls on a new moon, which cannot be scientifically calculated, and can only be observed. In ancient times, the Temple Priests would send Two Witnesses to observe the new moon, and the Nation of Israel would set aside two days to ensure that they did not profane the Sabbath which can fall on any day and it can be announced at any hour, as the Two Witnesses would send a confirmation that the New Moon had begun. The Israelites would wait in anticipation for the Two Witnesses to confirm the observation and the Priests to announce the Feast had begun by the blowing of the trumpets. Now, let us read the Revelation verse once more with a few surrounding verses and see if all of this makes sense now that we have allowed the Bible to interpret the Prophetic Word of the Revelation of our Messiah Yeshua. Rev 1:10 I was in the Spirit on the Lord’s day, and heard behind me a great voice, as of a trumpet, 11 Saying, I am Alpha and Omega, the first and the last: and, What thou seest, write in a book, and send it unto the seven churches which are in Asia; unto Ephesus, and unto Smyrna, and unto Pergamos, and unto Thyatira, and unto Sardis, and unto Philadelphia, and unto Laodicea. Now we can see that it makes perfect sense that John would receive Revelation on the Feast of Trumpets, a day also known as “The Day of Announcements”. It is no coincidence that he received the Revelation on this day, and as a Torah/Law observing Jew, John probably was anticipating an announcement at this point in time as we all who understand the significance of this time of year do every year. We anticipate the great trumpet announcement from the throne room so we can be witnesses and proclaim the message throughout the Earth. Some years are small announcements, some years very significant prophetic things happen, but we are always waiting in anticipation for the announcement of our King and Messiah Yeshua. So, what we have learned here is that the traditional interpretation is simply a tradition of men with absolutely no edifying value whatsoever, and we have learned that if we let the Bible interpret and define the Bible, the Book of Revelation will not as a book that is sealed so we cannot understand, but Heavenly instructions from our King that we must take quite seriously with all diligence when we study this book. We have found that we have inherited lies from our forefathers, as also was prophesied to happen. Jer 16:19 O Yahweh, my strength, and my fortress, and my refuge in the day of affliction, the Gentiles shall come unto thee from the ends of the earth, and shall say, Surely our fathers have inherited lies, vanity, and things wherein there is no profit. 20 Shall a man make elohim unto himself, and they are no elohim? 21 Therefore, behold, I will this once cause them to know, I will cause them to know mine hand and my might; and they shall know that my name is Yahweh. Blessed is he who comes in the name of YHVH, Amein Amein, HaShem Yeshua! This is very, very good, Eric! But I have a question… and it is one that is posed to us by one who believes the “sliver” is the New Moon. Question: if the New Moon is dark and does not give its light, then how does one “observe” it? You said that Temple Priests would send out witnesses to “observe” the moon and give their confirmation when it had occurred (paraphrased). How do you address this to those people? Also, I thought the New Moon (dark moon) was calculated by NASA, and other astronomers, etc. Thanks for all you do in your ministry!! If the full moon is the 15th of the month, sometimes the 14th, how can a slivermoon be correct, the better question to ask is if the full moon is the middle of the month, should not the completely dark moon be the first day? You all say, “How can a dark moon be observed?” Well, there are hundreds of observed dark moons by scientists every month, what keeps us from the same? If the last sliver can be seen, should we not understand when the dark moon, or new moon will be? If you count the days in the Month you can see quite easily when the dark moon is, Shalom. Here is an excellent teaching explaining an oft misused passage. Enjoy and please post comments and thoughts. I would like to make a suggestion regarding the phrase, “And the moon shall not give her light” in relation to the Day of Trumpets. To use this as justification for the conjunction as the new moon, it does contradict the principle of witnessing that was used to determine the new moon. Think of trying to identify someone in a line up where the room they are located in is completely pitch black. Another thing to consider is that the moon shall not give HER light, which we know is a reflection of the sun’s light. Could it be that when the Messiah returns that His radiance and light will illuminate the moon instead of the sun? I know this is speculation, which is why I am presenting this as thought provoking and not absolute. Consider the fact that the conjunction or astronomical new moon is a more recent term and in ancient times the only way to witness the new moon was with the naked eye.